These stickers are shiny metallic silver and blue. 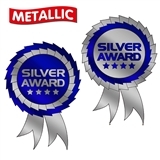 a great colour combination for a 'Silver Award' sticker. Your stickers come to you on an A4 sheet of 25 and each stickers is approx. 55mm x 35mm. 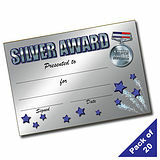 A popular choice for schools who reward using Gold, Silver & Bronze. 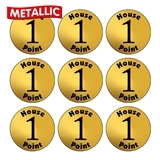 Click here to see our metallic rosette range.